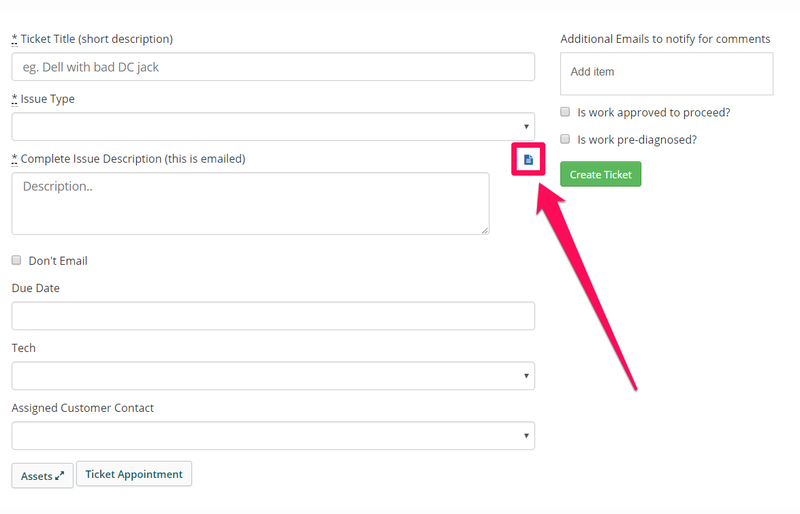 How do I create Tickets automatically from inbound Email? Canned Responses are an easy way of quickly responding to common questions and other messages. Some basic uses for canned responses could be to reply to common questions, quickly give out information or complex instructions, or even making sure your technicians are giving out the right information by writing the messages for them as a canned message. You can add new Canned Responses by clicking on the green "New Canned Response" button in the top right. To modify a field like the 'Title' or 'Body' field, just click on it once to free it up for editing. Then you can click "Save" when you're done to save the text in that field. You can click the "Insert" button next to each response to add it to the New Ticket Comment box. Clicking this will only add the Canned Response to the New Ticket Comment box where you can modify it further, it will not automatically send that message to the customer. You can also search through your Canned Responses quickly by typing in to the search field for quick access! You can click the "modify" link at the top to quickly access the Canned Responses Admin page where you can add/remove/edit all of your Canned Responses. You can also access this page via the Admin menu at: Admin > Tickets > Canned Responses. Thank you for response. We'll proceed with the fix and let you know when it's ready to pick up. We took a look at your computer and the issue is *. It will be $ to repair. Shall we proceed with the fix? Just following up on your diagnosis. The issue is ***. It will be $*** to repair. Shall we proceed with the fix? If so, you can follow the link to the Online Portal and click your invoice to make payment. Hey there - your computer is all set. We just finished cleaning it up and you can come get it any time. Thanks! We are open 9-7 m-f, and 11-5 on sat. I wanted to let you know that the work on your computer is done. Generally drop-off times are between 10:00am - 4:00pm Monday - Friday. You can look at my schedule and let me know when you are also available. I will then confirm with you to set up the drop-off time.